Data.gov recently updated its Metrics page to provide greater detail and transparency to the progress of the Data.gov catalog. Data.gov is primarily a metadata catalog, providing information about, and links to, open datasets made available by federal agencies and participating non-federal sources such as state, county, and city governments. Data.gov features metadata such as title, description, keywords, contact information, and access or download links for nearly 200,000 datasets. Data.gov obtains the metadata from federal and non-federal government sources that maintain their metadata following a specific schema. When an agency adds metadata for a new dataset, Data.gov discovers the addition in the next regularly scheduled “harvest” of the agency’s metadata source (in most cases, on a nightly basis). The updated Metrics page gives a breakdown of all the datasets currently on Data.gov. 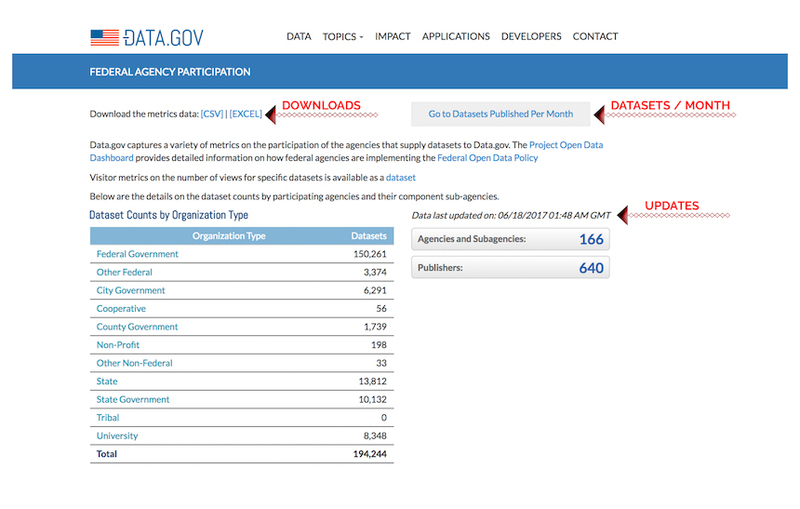 You can see the number of federal datasets vs. non-federal, and the number of agencies featured. Scrolling through the page, you can see how many datasets are listed by each agency. Where you see a + symbol, you can expand to see a more detailed breakdown of how many datasets are contributed by components within an agency or a department. The “Latest Entry” column on the right shows the date of the most recent change in an agency’s dataset collection–an addition, deletion, or change in the metadata for a dataset. The data from the Metrics page itself can be downloaded as a CSV or Excel. A history of the datasets published per month, going back to 2013, is also available. The Metrics page is updated automatically on a nightly basis. For more background on Data.gov metrics, including how the dataset count is determined, see our updated About page.